IPL 2019: Rajasthan need 18 runs in 20 balls. 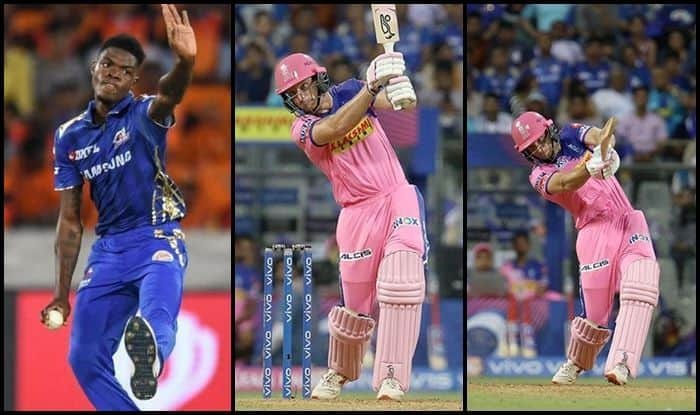 IPL 2019: Jos Buttler looked in ominous touch in a 188 run chase against Mumbai Indians. Buttler smashed a breathtaking 89 off 43 balls to get the Royals in the driver’s seat. His innings comprised of good cricketing shots as he found gaps at will. His innings was laced with seven sixes and eight fours. Buttler also picked 28 runs off an Alzarri over. It was the 13th over where Buttler hit four fours and two sixes. It was also the joint highest runs of a single over in the ongoing 2019 edition of IPL thus far. Earlier in the day, it was a good toss to lose for Mumbai Indians (MI) at the Wankhede Stadium on Saturday as they piled up 187/5 against Rajasthan Royals (RR) after being put into bat in their Indian Premier League (IPL) clash on Saturday.